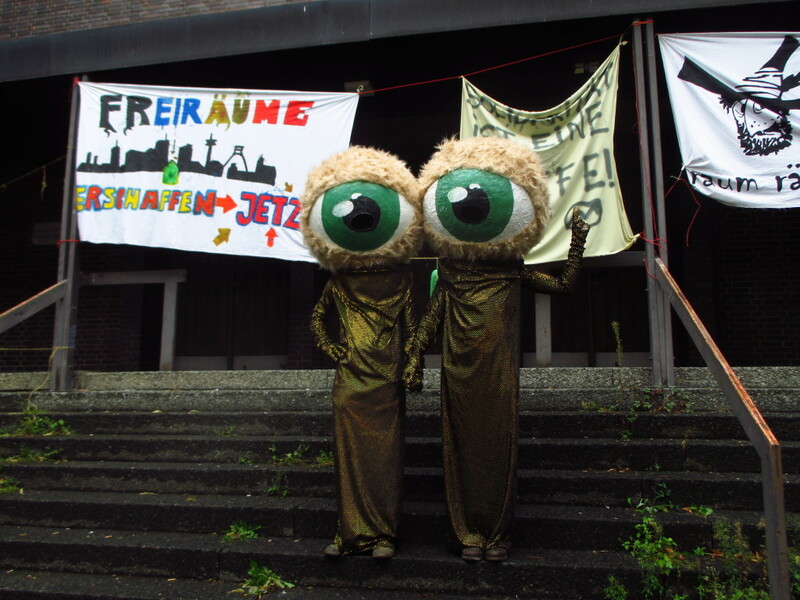 In the evening of Friday the 22nd of August 2014, activists occupied the former St. Albertus Magnus church in Dortmund which was unused for over 7 years. Only minutes after the occupation was made public, nearly 40 supporters came to the area and held a gathering in front of the church in solidarity with the project and the squatters. Of course, it didn’t take long before the cops also arrived at the location, but they didn’t attempt to raid the building, and instead controlled the supporters outside. The next day, a priest in charge of matters of the church building spoke to the squatters and stated he will tolerate the occupation for one week. Immediately activists began to form work groups, trying to renovate the building to establish a social center. 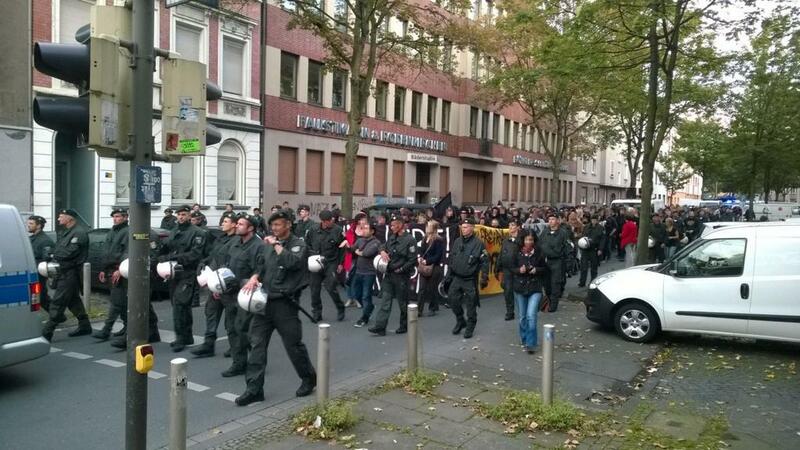 Dortmund has a big neo-Nazi problem, so it was expected that the squat would be faced with fascists sooner or later. Already during the first night of the occupation people saw Nazis driving by in the surrounding streets. This was definitely not a coincidence, because that part of the city is heavily populated by people with a migrant background. On Saturday the 23rd, Nazis held a rally in the city of Dortmund to protest against the ban on their former organization Nationaler Widerstand Dortmund (National Resistance Dortmund), but were soon blocked by hundreds of antifascists. Soon afterwards, around 40 Nazis appeared in front of the new squat in Enscheder Street and shouted “we will get all of you.” At first there was no police presence, and the squatters resisted the attack by throwing a couple of stones from the circa 17-meter-high rooftop of the building. However nobody was injured. Then police arrived and told Nazis to go 30 meters down the street, where they held a protest against the squat. This manifestation had been authorized by police the night before, at 3am, and nobody knew about it (not even the media). This fact raised criticism against the police even in bourgeois parts of the Press and the public, but a few days later all criticism was addressed against the squatters for throwing stones at fascists and the cops. Many of the hundreds of antifascists who had blocked the Nazis earlier in the city came to the squat as soon as they heard it was attacked by Nazis. On the same day the Nazis posted a video on their facebook page with footage showing the moments when stones were thrown at them, and they said they’d pay 1500€ for anyone willing to give them names of the squatters. Despite the Nazi attack and constant intimidation, activists kept working and really started to build up a social center in the squatted church. Every day there was an open assembly, where neighbours were able to participate. A few neighbours became involved in the squatting project or helped by giving water or even electricity supply. There were daily events, like concerts, readings, art exhibitions or jam sessions. 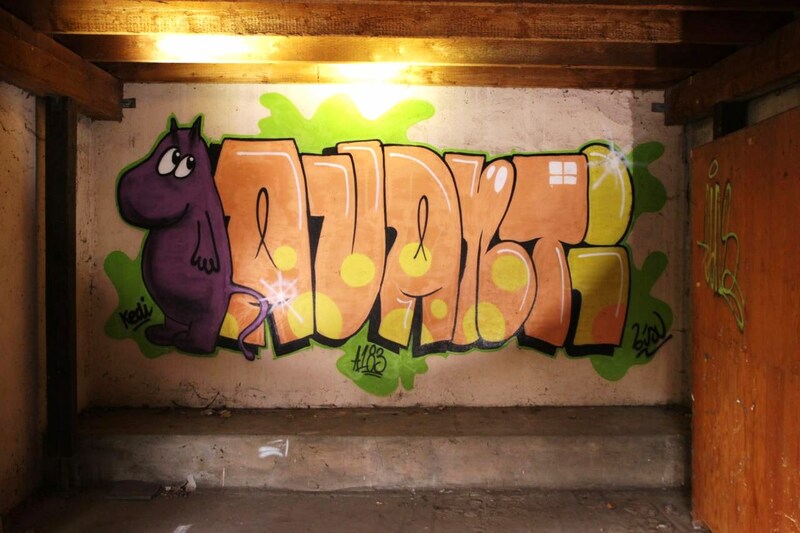 Hundreds of interested people visited the squat, participated and helped in organizing new events. Ideas of what could be done in the social center Avanti were almost endless. Catering was also made possible, and of course everything was free. The priest, who had spoken about toleration towards the squatters, was stunned by what the activists had accomplished in such a short time. Even after he had a meeting with other authorities of the church, and they decided that they would not allow activists to stay after the week of toleration, the mood was still good at the squat and many people were confident that the social center Avanti would live on. In the meantime rumors were spread publicly, also in the Press, that the “nice and cooperative activists could be infiltrated by militants, who would take the lead should an eviction take place.” On Thursday the 28th a family festivity was carried out in the squat, when an inflatable castle was built inside, and new visitors were given tours through the building. Nobody knew this would be the last action in the squatted Avanti. In the evening, activists organized a demonstration in solidarity with Avanti and people affected by repression. The fact that over 350 protesters took part in the demonstration shows the big interest in Avanti; normally, the large autonomous demonstrations in Dortmund (against fascists, for example) consist of around 200-250 people. It was a loud demo with lots of slogans chanted against cops. Over the past few days, repression has escalated. Several of the people who were in the squat during the raid were visited by cops at their homes and asked to tell who threw the stones at the fascists. The police offered everyone a 3000€ reward for snitching, and published photos of squatters who were on the rooftop of the building when the Nazis attacked the squat. It is highly likely that the cops will also try to harass the rest of the people and maybe even search their homes. Participants in Avanti organized a concert on Friday the 5th of September to show that they are still active. This fight isn’t over yet, as the activists said they will neither be intimidated nor divided by the cops, the Press, or the neo-Nazis. The slogan that keeps getting shouted is: Avanti lives! Avanti fights!